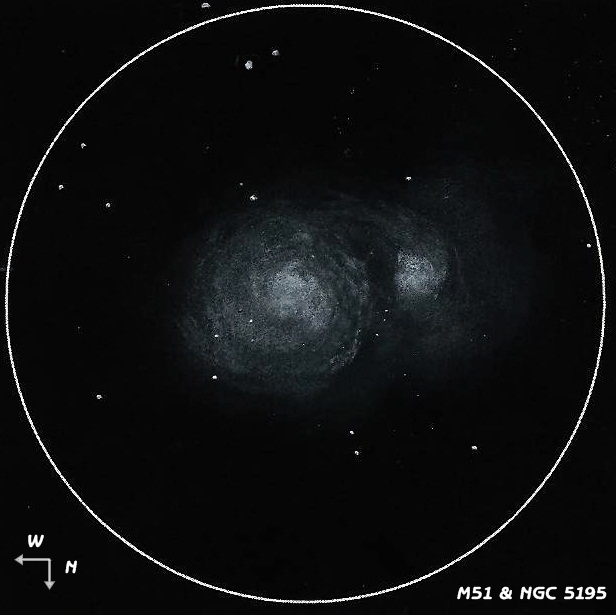 One of my favorite objects to observe on dark, excellent seeing nights is M51 & companion galaxy NGC 5195. 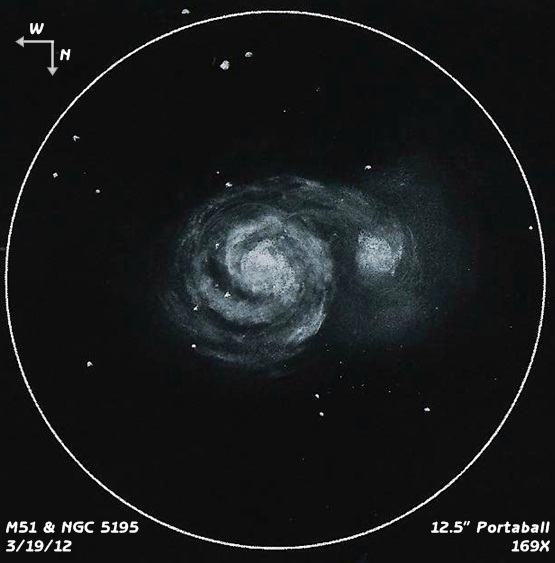 Seeing was excellent on the night of 3/19/12 & I sketched prominent features of the galaxies from the scope using a red light to see the paper. After returning inside for the night I decided to clean up my sketch & enhance some of the features I made notes on. A few nights later I went back to check on my accuracy. Although I could see a lot of detail with my 12.5” Portaball, I realized I had over enhanced my sketch. I then stayed at the scope to remove the enhancements that were not accurate. This was a good learning experience for me. It is sometimes difficult to observe & stay dark adapted even with red light, and my visual acuity isn’t what it once was. In the future I plan to sketch, make notes, clean up the sketch with better light but then return to the subject to verify what I have truly observed. Your first sketch is slightly exaggerated, while the second is slightly pessimistic, given your observing circumstances. However, both are excellent sketches and show details other sketchers rarely show with even larger apertures. What I notice, however, is that both sketches are missing the intensely bright nucleus that is small enough to be almost stellar. If you can see the semi-circular haze around NGC5195, then surely the bright nucleus and the faint “arm tail” opposite the companion should show up. The arm opposite the companion is brighter than the semi-circular haze around the companion. As I see it, the arm opposite the companion protrudes from the disk of the galaxy about the same distance as the companion on the other side. I suggest you leave the second sketch as is, and go back and look for fainter extensions of the galaxy in all directions, and add to the sketch as the fainter areas become seen.